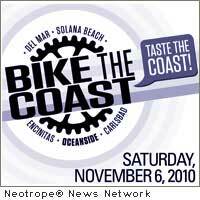 OCEANSIDE, Calif. (CitizenWire) — Event Media, Inc., producer of Bike the Coast – Taste the Coast, a new event scheduled for November 6, 2010, announces partnerships with the City of Oceanside Bicycle Committee, Main Street Oceanside and the Oceanside Chamber of Commerce. These groups, along with the Oceanside Visitors Bureau, are bringing together the cycling and business communities in Oceanside to promote bicycling and offer a festival at the Oceanside Pier with food, drink, music and fun. The Oceanside Chamber of Commerce has also partnered with Bike the Coast – Taste the Coast to promote and sell exhibitor booths and sponsorship packages. “The Oceanside Chamber of Commerce is excited about this partnership in a new event for the City. I think it will take off and be successful. We are looking forward to a long term relationship,” said David Nydegger, CEO. Bike The Coast offers a choice of 7, 15, 25 or 50-mile bicycle ride starting and finishing with food, fun and music at the Oceanside Pier on November 6, 2010. The cycling courses include the San Luis Rey Bike Trail and San Diego’s North County beach towns of Oceanside, Carlsbad, Encinitas, Solana Beach and Del Mar. Beginners and experienced cyclists are welcome. Kids are welcome with parents, and the Bike Trail routes are perfect for visitors with beach cruisers as well as riders with mountain bikes, road bikes and BMX bikes. Proceeds from the ride support the San Diego County Bicycle Coalition (www.sdcbc.org) a 501(c)3 non-profit organization dedicated to making bicycling better in greater San Diego and producers of Bike The Bay in August. For more information about Bike The Coast including registration and sponsorship and exhibition packets go to www.Bike-the-Coast.com or call 760/632-6843. For Oceanside Travel Information, including special deals on hotel rates go to www.visitoceanside.org or call 760/721-1101. The City of Oceanside Bicycle Committee organized a subcommittee with Bike the Coast – Taste the Coast organizers to engage community volunteers in helping with the event. For more information on volunteering please call 760/632-6843. For more information please visit www.msoceanside.com . For more information please visit www.oceansidechamber.com . News Source: Event Media, Inc. :: This news story was first issued by and is Copyright © 2010 the Neotrope® News Network – all rights reserved. Originally published on CitizenWire™.